This is the most important dish for the Tamil New Year. This pachadi has all the tastes - sweetness from jaggery, sourness from mangoes, saltiness, bitterness from neem flowers and hotness from chillies which indicates that life is also a mixture of all emotions, has ups and downs but on the whole it is wonderful and sweet just like this pachadi. Peel the skin of the mango and discard them. Then slice the mango thinly or you may even peel it. Add the water in a saucepan and cook the mango slices. 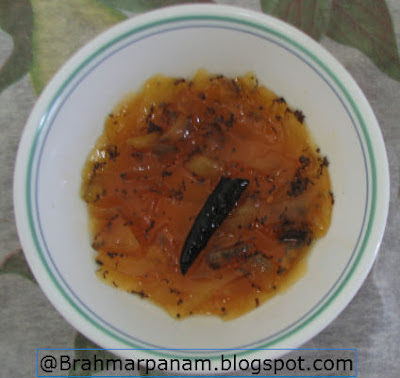 When the mango is cooked, add the jaggery and stir well till it dissolves and the mixture thickens. Heat oil in a small pan and add the mustard seeds. When it crackles add the red chilly and the Neem flowers and stir them for a minute. Add this to the pachadi and the Mango Pachadi is ready to serve. I love this pachadi -look forward to this in summer every year.